Memberships are now up for renewal £7 for the year, New members always welcome just £7.50 to join. Please pop in and fill out a form. 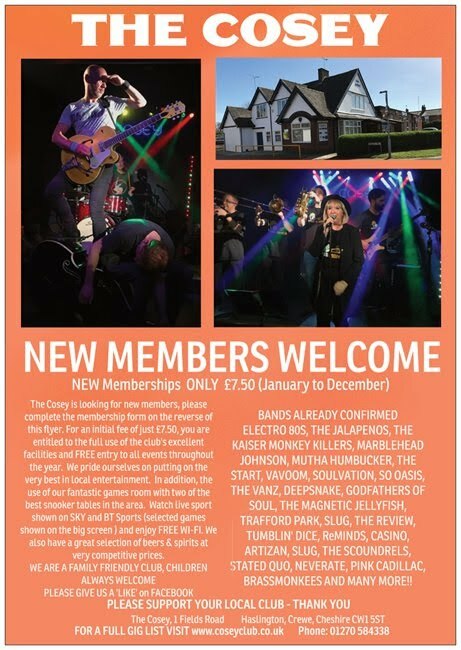 New members always welcome, please call in for details! Another fun night at the Cosey entertained by The Assets. They're not the next big girl band....they're not the next big boy band.......they're a band with big girls and big boys in it!! Ever popular and hard working local three-piece covers act The Jem bring their interpretation of classic crowd pleasers from the 60's - present day. Local band Artizan benefits from high energy and A grade ability to cover a range of rock era anthems and sing along classics, not forgetting some modern day tracks to please the younger audiences. So expect tracks from Bon Jovi, Kings Of Leon, Fleetwood Mac, Red Hot Chilli Peppers, Franz Ferdinand, Guns N Roses, Foo Fighters, Whitesnake, Tears For Fears, Stereophonics Bryan Adams and much much More! A mix to entertain everybody. Vavoom are a Stray Cats inspired three-piece band which plays popular covers ranging from Elvis, Eddie Cochran, Gene Vincent through to The Ramones, Smiths and Led Zeppelin with a rockabilly look and sound coloured with Jazz, Punk and Indie influences. A new and Dynamic band The Godfathers of Soul. With top class seasoned musicians and souring vocals.Covering Soul and Motown Classics. Expect covers from The Drifters, The Stylistics ,The Northern Soul scene....Otis Redding, Stax, The Funk Brothers, Motown. First time at the Cosey for Tourniquet Rock. Female fronted covers band, covering songs from some of the best female vocalists ever! With a few of the top guys thrown in for good measure!! Retro covers band who play a great selection of 60’s & 70’s pop/chart songs from bands such as The Travelling Wilburys, The Eagles, The Beach Boys, Elvis and many more!! So-Oasis make a welcome return to The Cosey playing all the classics from the Manchester Giants. In 2018 the guys approached Sammy to get this act off the ground again - this has affected man banter in the van but not affected the show!!! Composed of a group of inspirational musicians and skilfull performers, the artists behind Deepsnake have earned their reputation as a talented band to look out for. Fantastic Rock covers band. Playing Rock classics from the 60's right through to present day. Thin Lizzy, The Rolling Stones, Stereophonics and Blackberry Smoke to name a few. Back to the Future Duo playing the best of 80's and 90's music. Steve 'Dr. Emmett Brown' Pepper on Bass and Vocals and Dominic 'Marty McFly' Jones on Guitar and vocals! Fantastic band not to be missed!! One of Stoke on Trent's most popular indie covers bands, a fab five-piece band playing indie covers and retro classics from past and present. A welcome return for the Brass Monkees - A lively bunch bringing an action packed fun-filled combination of Soul, R&B, Funk & Motown! A highly experienced three-piece live band featuring ex Members of Billy J Kramer & the Dakotas, The Magill 5 & The Casuals. ﻿The audience is taken on a tour of the 60's, with plenty of humour to make it a night out to remember featuring songs from The Beatles,The Tremeloes,The Fortunes,The Monkees,The Shadows, The Hollies and more…. The Conspirators are a professional three piece band, covering classic rock, pop and soul hits over the decades. They have existed as a band for over 40 years and are highly experienced in thrilling audiences of all ages. They have over 100 songs in their ever expanding repertoire, covering many great and iconic artists. Expect to hear classic T Rex hits Hot Love, Ride a white swan, Metal Guru, Jeepster, Telegram Sam, 20th century boy & glam rock greatest hits such as Bowie, Slade, Sweet, Showaddywaddy, Queen, Mud, 10CC, Sparks etc. The Gospel Truth Soul&Motown are a Four piece band. They have been together as this band for four years but we have been together as The Gospel Truth Band for Six years with the old line up with other members having been replaced to now the the New Gospel Truth soul Band, We are all professional musicians with Fifty years in the entertainment business and still get a kick out of playing our style of music. Back by popular demand. The Review are one of the UK's most consistently in demand party bands. With thousands of performances all over Europe in the last 6 years, it's nothing but the greatest Rock, Pop, Soul and Dance Party Anthems all night long! Songs from Bruno Mars, Katy Perry, The Beatles, The Rolling Stones, Arctic Monkeys, Kings of Leon and everything in between - there is something for everyone to enjoy. A welcome return to the Cosey for Monkey Finger.Yes, it’s time to dust off your smiles, get your glad rags on and come and marvel at a unique blend of musicianship, good looks and messing about that is unrivalled on any stage. Magnetic Jellyfish are a Stoke on Trent based covers band,they play songs from the Indie/Modern Rock genre, they cater for a mixed age group and have a following second to none. Formed in the year 2000 they have become Stoke-on-Trent's most popular covers band. They cover a wide variety of artists such as : - Stereophonics, Foo Fighters, Kings of Leon and Many More. The musician’s stage presence and performance is overwhelming, led by an amazing lead singer whose outstanding vocal range makes every performance a night to remember. The three-piece made up of guitarist Charlie Davidson, Rocking Johnny on bass and drummer Diamond Dave have been touring for well over 10 years, building up a reputation for energetic and visual shows. Find the Cosey on facebook to keep in touch & for updates & news of events. We are Haslington’s only club where you can socialise, see live music, play Snooker or Darts & take advantage of the keenest bar prices in the village. The Cosey Is run by the members for the members. This is just a sample of what you can expect. Friday The Weekend stars here! Our Live Music night. Featuring the best up-front local bands with style, playing rock, indie, hi-energy rock & roll covers & more! Acoustic Night every other Monday evening. Local Singers & Songwriters Perform. The Darts & Dominoes team play on Monday nights in the Premier league. We also have a Darts team in the County League. And we have regular Darts knockouts with prize money up for grabs. A new Dominoes league now plays on Tuesdays. Having a Party? Members often hold parties here. If you are looking for somewhere to hold you next birthday party, why not ask about using the club? Or You could just invite your friends down to share one of our Friday or Saturday nights. Local groups. Would you like to make use of the Club? The WI meet here (2nd Tuesday of the month). Perhaps we can help you? Requests? Can we do anything for you? Just ask!